Do you remember my working for a man who had a two or three car garage, named Tommy Ryan? I worked for him twice. It was when I was with Western Electric. They went on strike twice, once for nine weeks, and seven weeks another time. I never did go down and picket because I couldn't afford to be without work. I was the sole support for the family and I had to go out and find a temporary job. The first time I met Tommy Ryan, he was a young man, about 30 years old. Very energetic, very honest. He was a polite, regular person, nothing argumentative about him. He was pleasant to customers and employees. I got the job through Jule Sufiza. He owned the gas station on 9th Street and South Orange Avenue, across the street from the church. I worked for him for a few months, too. He knew Tommy was looking for a man, and said "Go over and talk to him." So I went to see Tommy and I told him who sent me and he said "Yeah, I can use a man." I told him I was on strike at Western Electric, and expected to go back to work when the strike ended. He said it was OK, he'd just as soon work it that way, because if he didn't have enough work for me, he wouldn't be able to keep me on permanently anyway. 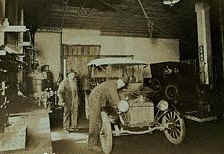 His repair shop was just a row of three or four garages in an alley behind the firehouse located on 13th Street and Avon Avenue. The firehouse was right on the corner, and he rented the little garages and used them for auto repair work. There were just he and I and one other mechanic. Later at another location, he had a four-car garage, but anyway he had just the two of us helping him. I worked for him for nine weeks. He paid me well. It was in the wintertime. The only means of heat was a little pot- bellied stove in the garage. Whoever got there first in the morning had to start it up and get it going. We would start a fire with coal and wood and stuff, and heat the place up so that we could use some of the tools, which were frozen stiff. It was ice cold in the morning, and we had to get the temperature a little warmer so that we could manipulate the tools and work. For the nine weeks, I was the first one there every morning. I managed to get there about a half-hour early before starting time, and shake the old coals out of the stove and put in new coals for the day. By the time Tommy and his helper came in at 7:30 a.m., the place was fairly warm. Not hot, but fairly warm. They were happy about it because that saved them a job every day. I didn't mind. It was my own choice. I appreciated Tommy helping me during this crisis, and figured that it was the least I could do for him. When the strike ended I went back to Western Electric. Of course, we stayed in contact. When I needed to have some work done on my car, I'd go to Tommy Ryan's, and if I couldn't do it, he would do the work and never charge me for it. He was happy to do it for me. Another time I was off on a seven-week strike. I called him up, and he said yes, he could use me. He had a four-car garage over near the armory. It was a nicer place, a much cleaner place. We had heat there and everything. It's things like that--I mean, I helped him, and he helped me. I was tickled to do it because I didn't have to search for a job in order to carry on at home. That is the way I live. When someone helps me I go all out for him. I do twice as much for him. I almost throw myself into helping him, and pay him back double what he did for me because I appreciate the help. When you ask for help, it's like a person drowning. That's the way I feel. Someone is out there. He's helpless. He can't take care of himself. He can't do anything for himself. When he asks for help and somebody helps him, you can't imagine what that person will do for the help- and that's the way I felt. I think Tommy was going to move to Florida after we did, but I've never seen him. I do know that he spent a vacation down here at the beach one time. He wrote to me and told me about his vacation. But I never saw him after that. He passed away. He was separated from his wife. He had a wife you can do without.